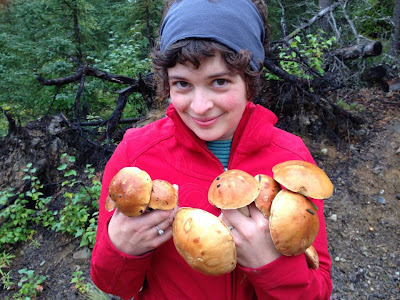 Mushroom season is in full force and with a little knowhow, you can join the foraging movement and become a mushroom hunter. Here is my DISCLAIMER: I've been foraging for mushrooms my whole life and I am positive that what I'm picking is edible. I am not a mushroom expert but I can give you great advice on how to discern boletus mushrooms from inedible ones. 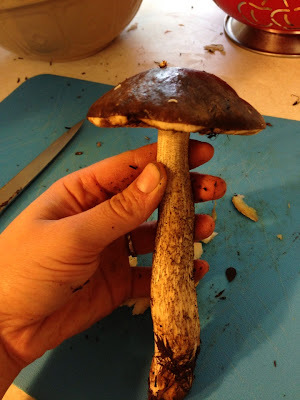 Pick at your own risk, but honestly, boletus are easy to detect and as long as you cook them thoroughly before eating, most mushrooms in Alaska will not kill you (but they might make you have some bad stomach problems). Feel free to contact me and e-mail me photos of your finds if you ever have any questions. 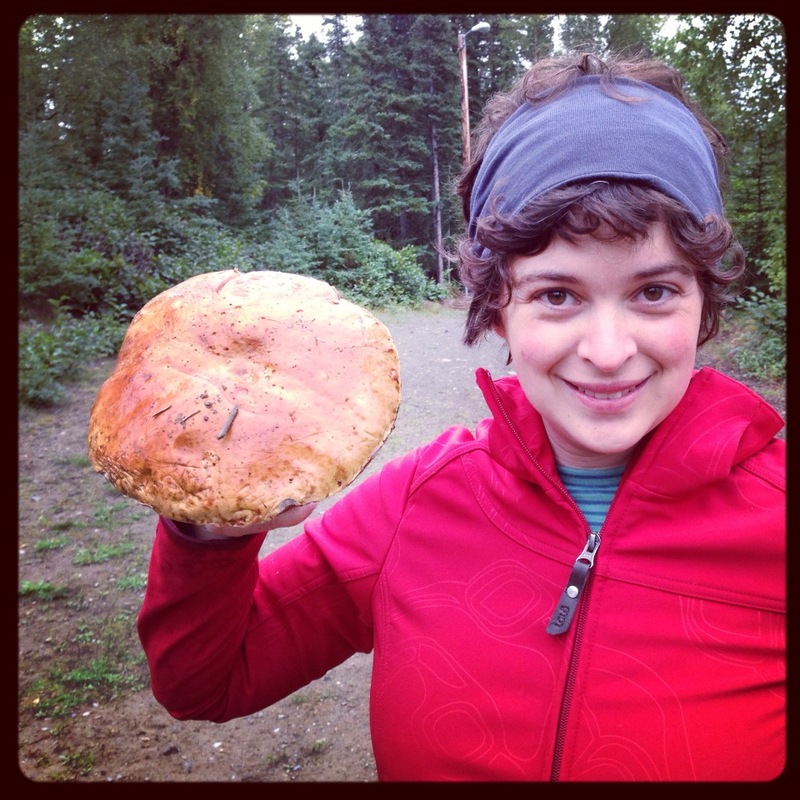 There are quite a few edible mushrooms in Alaska, but I'm only knowledgable about boletus. The only inedible boletes I've come across in Alaska are boletus ludiformus and boletus coniferarum. Ludiformus is red, which to me is a signal to not eat it. The coniferarum has yellow flesh that when bruised or cut will rapidly turn inky blue. Keep in mind that many edible types of boletus will oxidize, but not nearly as quickly as the coniferarum turns from yellow to blue. It looks pretty cool, but tastes extremely bitter (but will not kill you if eaten). You've got to get over these factors if you'd like to carry on. 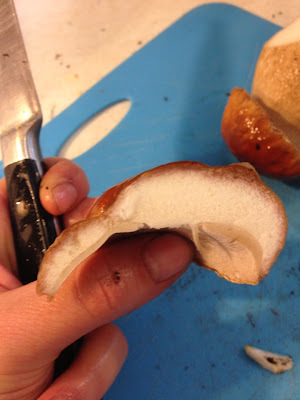 First, all edible boletes have sponge under the caps instead of gills. Boletes are the only mushroom in Anchorage forests that have sponge instead of gills besides the hawks wing mushroom, which has hedgehog-like spines underneath (and it's edible if you boil it). You can exclude any mushroom with gills because it will not be a bolete. This one fact makes bolete hunting reassuring because there is so much you can rule out. There are deceptive mushrooms that really look like bolete caps, but when you turn them over and see gills, just let them be. They tricked you! Aspen Scaber-stalk -- these are found in birch and spruce forests, typically around moss, low-bush cranberry and crow berry bushes. They have sienna-colored caps with dirty-looking stems (almost looks like the texture of a terry-cloth towel). The flesh also tends to oxidize and turn black when cut. Alaskan Scaber-stalk -- these look a lot like the Admirable bolete but smaller with a narrower stem. King bolete -- this is the purest, most prized bolete and is the equivalent of a wild porcini mushroom. These have light brown caps and white stems with no terry-cloth look to them. The sponge will turn yellow with age. All right, now let's set out to find some mushrooms! But where, might you ask? Well, boletes like to grow near spruce roots, birches and in mossy areas. You can often find boletes growing in people's yards. You usually won't find them in areas with long grasses and ferns or anywhere with tall vegetation. The trail system in Anchorage is a great place to start. You could also try Thunderbird Falls, Bird Creek and Girdwood. The best time to pick boletes is from late July to mid-September. Over the years I haven't found a true rhyme or reason to how boletes grow. Sometimes you'll have a summer with hundreds of pounds and others you won't find any. Usually they grow during the rainy and damp times of Alaska summers. Boletes can grow to be pretty huge, but it's best to pick them when they are just a couple of days old because bugs love boletes as much as humans do. They will flock to them pretty much as soon as they surface. It's rare to find a bolete that hasn't been lived in by a beetle or some sort of fly eggs, but if you pick them early on it doesn't affect the quality or taste of the mushroom. I'll show some photos later. This large bolete was literally teeming with insects and maggots. Didn't take this one home! Fresh boletes should have firm stems and caps, but it's ok if the cap is slightly soft. If you find a really squishy bolete, let it be because the bugs have laid claim to it. Sometimes you'll find a bolete that's firm on the cap, but when you look underneath it looks like bugs have taken it over. Not always true! 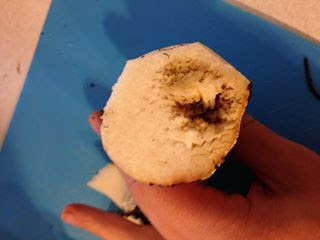 Sometimes the bugs just get into the sponge part of the mushroom, which can be easily removed. Break the cap in half. If the flesh is white and has no holes in it, then keep it. Baby boletes are the best. Their cap and stem are both firm and delicious. They also look totally phallic. I just had to put that out there. I recommend field dressing your mushrooms as you go. This means bringing a pocket knife along and whittling away the dirty root. I'm lazy and totally don't do this. It just means I'll have more trash to throw out at home. Boletes are sturdy so you can collect them in plastic grocery or garbage bags, five-gallon buckets, or if you're feeling whimsical, in a lovely basket. It's up to you. The great thing about picking mushrooms is they literally pop up overnight so many people could pick the same spot and still find a good share. You can usually tell if another bolete hunter has been in the area by the discarded caps and overturned trickster mushrooms. This weekend we covered the same ground as another hunter and still came out with nearly 40 pounds of mushrooms! 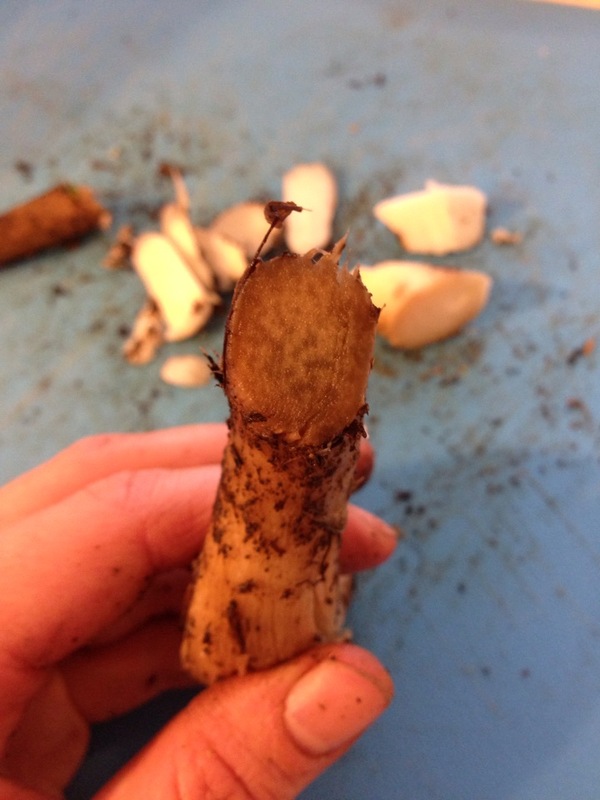 Start by whittling away the root of the mushroom to remove any soil. 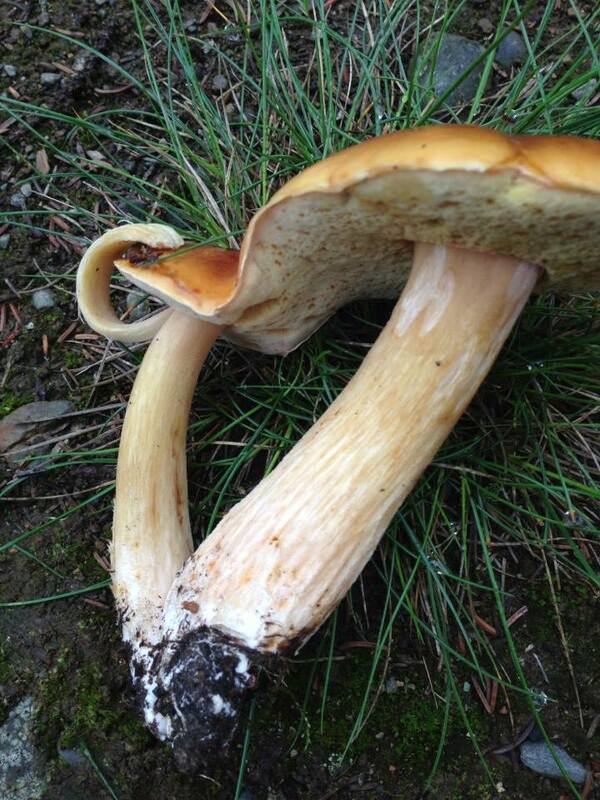 If you come across any bug-eaten mushrooms, either toss them or cut into the stem or cap to see if it's salvageable. Sometimes the bugs will have only gotten to half the mushroom, so why waste the whole thing? 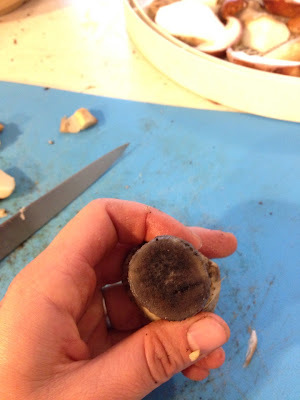 Once you've removed the big pieces of dirt, you can run each mushroom under cold water and lightly scrub with a nail brush to remove excess dirt. Only rinse them if you plan to use them right away. Rinsing them and then storing them in the fridge may cause them to rot. Now comes the part where you need to figure out what you're doing with your mushrooms. They can be stored in the fridge for a couple of days, but you'll want to prepare them as soon as you can. If you must store them, be sure to keep them in paper bags so they can breathe. Boletes should not be eaten raw. They will probably give you an upset stomach. If I'm not cooking with them right away I either sauté the mushrooms in butter, vacuum pack and freeze them or put them in a food dehydrator for a couple of days, bag them up or grind them into porcini powder. 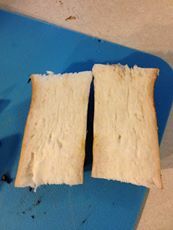 Either way, you'll need to slice them up. This is where you do most of the work. You might find that lots of your mushrooms are bug eaten. I tend to toss caps that are eaten even in the slightest, but really it's not gonna kill you so this is a matter of personal preference. 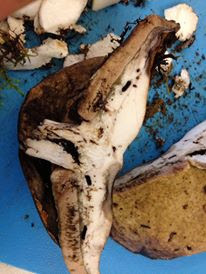 You'll be able to tell if the mushroom is too rotten to eat cause it will look totally gross. But as I said before, you can always try and cut away the nasty bits and keep the good bits. I mentioned before that you can remove the sponge. 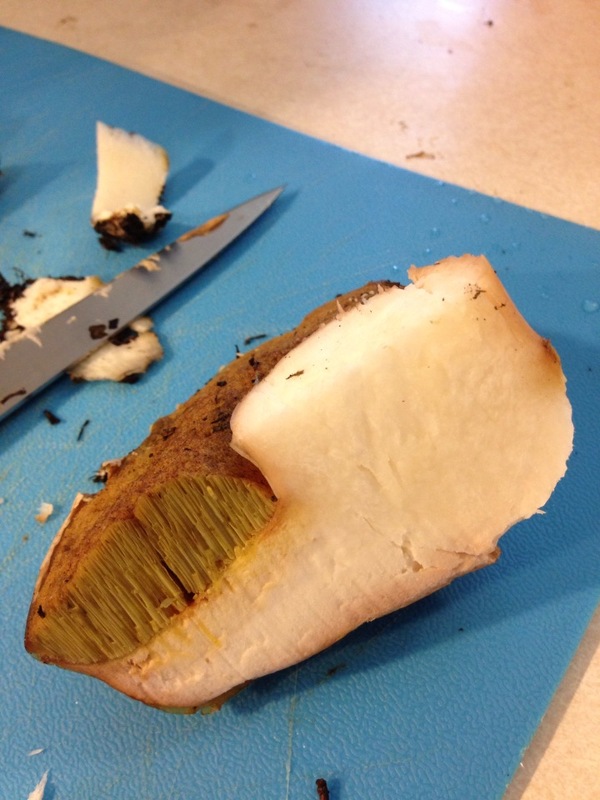 I do this with most mature boletes because the sponge ends up becoming slimy when cooking. With really new boletes, the sponge is firm and doesn't need to be removed. It's a bit like getting to an artichoke heart -- the sponge will peel off easily and you'll be left with the yummy cap. This aspen cap is totally nasty. Didn't keep any of it. See? Looks great! Peel off the sponge and you'll be fine. 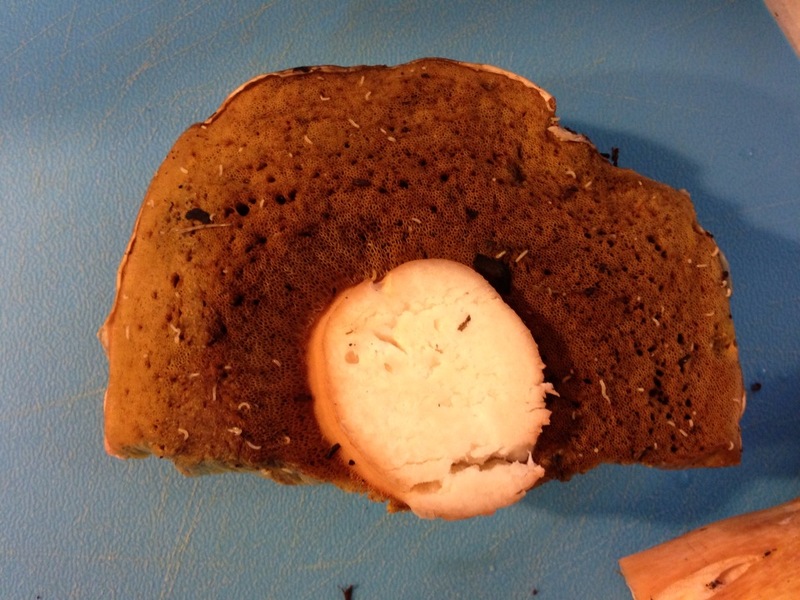 This is the inside of a good king bolete. Some parts have been eaten by a bug, but I wasn't horrified by it so I kept it. This Alaskan bolete has oxidized. Totally fine to eat! This is a fresh king cap. The sponge is thin and firm. It doesn't need to be peeled off. 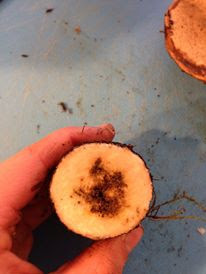 Once your boletes have been processed the world is your mushroom! 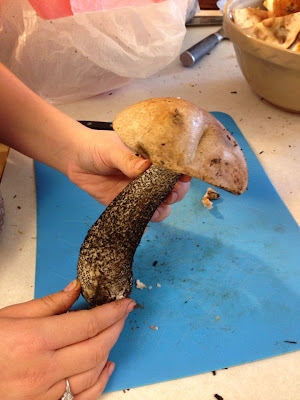 Boletes are great in soups and sauces, but your best bet is to do a Google search for recipes for porcini. If you've decided to dry your mushrooms, they will need to be reconstituted. Boil a couple of cups of water or chicken broth and pour over the dried mushrooms in a bowl. Let sit for 20 minutes and reserve the steeped water for your soup. It'll deepen the flavor even more. So, that's my guide to Alaska boletes. Please contact me if you have any questions, comments or even corrections. And remember, if you're not extremely positive about a mushroom, don't eat it. Better safe than sorry! Thank you for posting your thoughts and information, much appreciated. I've heard mycologists say it is not a good idea to keep wild (or any type) mushrooms in plastic bags. The question of what type of bag you'd put your baby in, plastic or paper, was brought up so I'm assuming the need for mushrooms to breathe is very important! They've also mentioned washing them with water is not absolutely necessary and should be avoided. I am by no means an expert, just sharing what I've learned so far. Thanks for your response to my post. I have also heard not to store mushrooms in plastic. I just use a plastic bag for collecting my mushrooms. I do not store them in plastic. If I keep them in the fridge, I store them in paper bags and only for one day. As for washing them, it's just personal preference. Sometimes boletes are heavily covered in soil so I give them a gentle wash to remove excess dirt. I only rinse them right before I'm about to prepare them. If I plan on storing them in the fridge, I will not rinse them. I too will use plastic bags for collecting. Our wet SE Alaskan summers make paper bags melt and baskets do not leave hands free to climb up and down hills or grab for bear spray if needed (never has been!). Washing mushrooms will wash out flavor. Be sure to check out my new Alaska mushroom series at Amazon including "Edible Mushrooms of Alaska". I'll have to get a copy of your book. Thanks for letting me know about it! I see these things close to my apartment in anchorage all the time. I'd been told what they were, but I was a little scared. You make it sound a lot easier to identify than most people. If I post or email a picture of a couple of these things can you confirm for me? Great post on Bolete harvests! A couple of things to note- the "Satans Bolete" you refer to is actually Boletus luridiformis which is considered edible when cooked thouroughly. 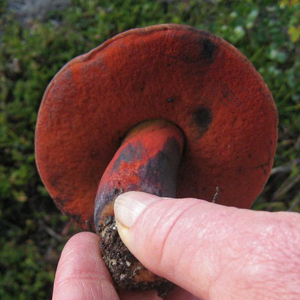 Boletus satanus doesn't occur this far north (more California). It's also wise to be cautious when eating Leccinums ("scaber stalks") as poisonings (mainly severe gastric upset) have been reported from Interior Alaska, the Rocky Mountains and the Cascade range. 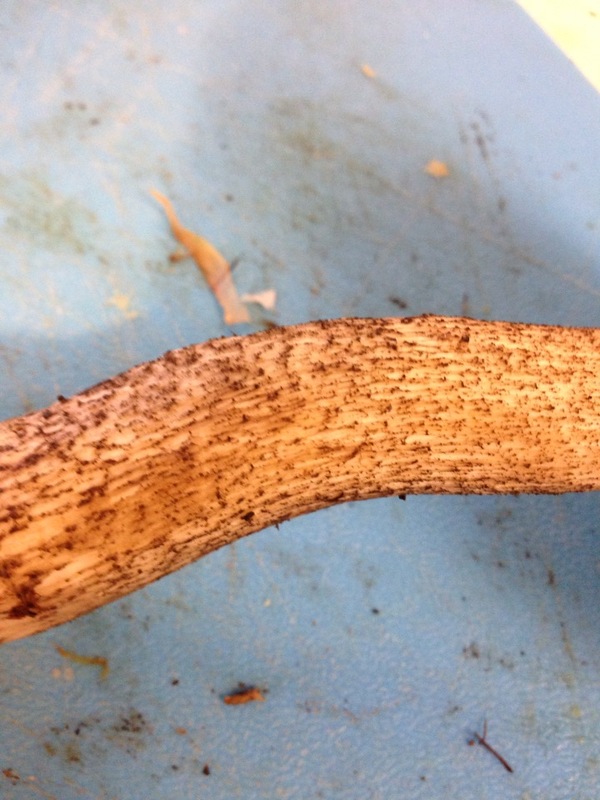 It is unclear from the reports exactly which Leccinum species were to blame. Thank you for your informative comment. I have never come across the boletus luridiformis or the boletus satanus, but the photo was taken by my father in Anchorage, Alaska. I have never experienced any gastric upset after consuming Leccinums, but that's good to know that others have. Thanks for your comment. If you have any mushroom-related questions, feel free to click the small "contact me" button at the top right of the site underneath the "Tales of an Alaskan crafter" header. Per bag vs basket...spore drop is obviously important, and being a fellow Parkour mushroom hunter, I found a restaurant size onion/potato bag with a nice shoulder strap is the best for jumping from shrump to shrump. Easily rests on my back when climbing and those things are fairly durable. Thanks for the read! And cook the Leccinums thouroughly!! They are a tasty bunch. An onion bag is a great idea. Thanks for the suggestion. Happy hunting!